Bottle of 120 gelcaps of freshly produced New Zealand Shark Liver Oil is known to help strengthen and regenerate the immune system. There is absolutely no other shark liver oil product on the market that matches the ultra purity and potency of this unique and freshly produced New Zealand product—the one-and-only original Ultramarine Shark Liver Oil. This product is often referred to as sea gold or ocean gold because it originates from God's amazing medicinal treasure chest, the deep sea. Ultramarine Shark Liver Oil is naturally rich in alkylglycerols (or alkoxyglycerols, AKGs, glycerol ether lipids) and squalene, and is extracted from the liver of deep-water Etmopterus sharks, which inhabit the cold non-polluted waters of New Zealand at depths of 3,000 to 5,000 feet. This superior, all-natural, whole shark liver oil is minimally processed to ensure that the alkylglycerol (or alkoxyglycerol, AKG, glycerol ether lipid) and squalene components and all of its natural trace elements are maintained. (Harsh processing and heat would strip the shark liver oil of many of its valuable natural constituents.) It is 100% pure and natural, with no artificial coloring, additives or preservatives. This shark liver oil is also environmentally sound: Only sharks caught as a by-product of deep-sea fishing are used. From a natural resource, which would otherwise have gone to waste, comes a valuable remedy. Already, nearly a quarter of a million bottles of this ultrapure and potent shark liver oil have tremendously benefited customers from around the world. Ultramarine Shark Liver Oil is an amazing supplement containing alkylglycerols (AKGs)—the primary active component in shark liver oil and renowned for offering nutritional support to the body's natural defense system. AKGs occur naturally in small amounts in human breast milk, bone marrow, the liver, and the spleen)—all of which are involved in the production of white blood cells. Our deep-sea Ultramarine Shark Liver Oil is tested and guaranteed free of detectable toxic contaminants such as heavy metals (i.e., mercury, lead, cadmium, arsenic, copper, iron, etc.) 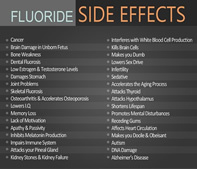 and pesticides (i.e. DDT, DDE, HCB, PCB, lindane, etc.). Ultramarine Shark Liver Oil, extremely rich in squalene and alkylglycerols, is truly nature's amazing healer. Squalene is recognized for its rejuvenating skin care properties. This minimally processed deep-sea shark liver oil also contains natural trace elements, enzymes and antioxidants that enhance its effectiveness. What is Ultramarine Shark Liver Oil? Ultramarine Shark Liver Oil is extracted from the liver of deep-water Etmopterus sharks, which inhabit the cold, non-polluted waters of New Zealand at depths of 3,000 to 5,000 feet. This superior, all-natural, whole shark liver oil is minimally processed to ensure that the alkylglycerol (or Alkoxyglycerol, AKG, glycerol ether lipid) and Squalene components and all of its natural trace elements are maintained. Harsh processing and heat are avoided which would strip the shark liver oil of many of its valuable natural constituents. It is 100% pure, with no artificial coloring, additives or preservatives. This shark liver oil is also environmentally sound as only sharks that are caught as a by-product of deep-sea fishing are used, making a valuable remedy from a natural resource that would have otherwise gone to waste. Shark liver oil is known to help strengthen and regenerate the immune system while benefiting many other functions and organs of the body. Has research been done on shark liver oil? Yes. Shark liver oil is known to help strengthen and regenerate the immune system while benefiting many other functions and organs of the body. The breakthrough Shark Liver Oil - Nature's Amazing Healer book, written by several medical doctors and researchers, provides facts about shark liver oil as an incredible immune strengthener and its many other wellness benefits. The book is also filled with documented studies and remarkable case histories as well as other useful information. "From the very beginning of my research with Dr. Astrid Brohult and her family in the 1950s, we concentrated our work on Alkylglycerols or AKGs. Dr. Astrid Brohult was seeking an immune-system stimulator and strengthener, a substance which would have the most positive impact on the human immune system, a substance which would offer the promise of help for many diseases that had wreaked havoc on mankind for centuries. Alkylglycerols are such a substance. Shark Liver Oil as a food supplement can be beneficial to all, whether taken for general health purposes or to impact on a particular immunodeficiency. Its wonders are waiting for you to discover them." How much Diacylglycerol Ethers (D.A.G.E. ), Alkylglycerols (or Alkoxyglycerol, AKG, glycerol ether lipid), and Squalene is in the Ultramarine Shark Liver Oil Gelcaps product? One adult serving provides 540 mg of Diacylglycerol Ethers (D.A.G.E.) yielding a pure and potent 210 mg of Alkylglycerols with 675 mg of Squalene. Each bottle contains 120 gelcaps (570 mg shark liver oil per gelcap). Can I take the Squalamax™ product along with the Ultramarine Shark Liver Oil Gelcaps product? 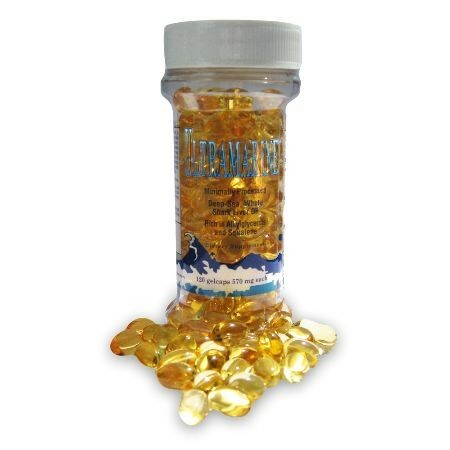 Yes, if your health challenge would benefit from it, the Squalamax™ product contains squalamine which enhances the effectiveness of the Ultramarine Shark Liver Oil Gelcaps. NOTE: Any person with a known allergy to fish products should consult a healthcare practitioner before taking this product. How much Ultramarine Shark Liver Oil should I take daily? We suggest Adults take 2-3 gelcaps daily and Children take 1-2 gelcaps daily, on an empty stomach. For more serious health challenges and/or larger doses, please consult your healthcare practitioner. I Love This Product!! , Review by Ashly B.
I take 1 at night does the trick. I sleep all night painless. I take 1 in morning and I feel great all day! Helps with my joints, muscles ...brain. I just feel better, stronger! I spent a long time looking for the best Shark Liver Oil, and had narrowed it down to the Vitasalus Ultramarine Shark Liver Oil, but still wanted some reassurance. I called and got the chance to talk to Robert who had answers to all my questions. It was obvious to me I was getting a genuine product, and now that I have received it, and am enjoying taking it, I can confirm I made the right decision. Ultramarine Shark Liver Oil Gelcaps. I have never felt healthier in my adult life, except when I was taking these daily. My body felt stronger and my mind even felt stronger. My body was beaten down with pain constantly throughout every muscle, joint, tendon and ruining my cartilage daily. When I started taking these, a couple weeks later, I felt like I was unstoppable. Amazing product!